...and a GIVEAWAY, so keep reading! THIS GIVEAWAY IS NOW CLOSED. When I browsed through this eBook, I was struck by the simplicity of each layout. And that comment is meant with the highest regards. So many times, I think we get caught up with the latest and greatest technique, embellishment, fad, or whatever, that we forget that we should just go with our heart and what it's saying to us. It's the everyday moments I remember from my own childhood, so I tend to try to capture those moments with my camera, so that my kids will remember them, too. With a little help from their Mom, wink, wink! Here, Elizabeth Dillow employs a unique viewpoint in her photo and allows it to take center stage. Her journaling is heartfelt and her title is succinct. The dark cardstock makes the whole layout pop. Simple at it's best, again. I could fill a whole album about my husband's fondness for all things with wheels...4-wheelers, motorcycles, cars, trucks, cars, more trucks, Jeeps, cars, more cars, trucks, and another truck and now a Scout. He loves nice cars, fast cars and cars that can be worked on and fixed up. He's in the process of restoring this Scout, similar to the one he learned to drive with. It's amazing that this will be my first layout in our WE album about this love. Thanks, Elizabeth, for helping me to get this story documented! And now, I'm thrilled to be able to introduce you to the next blog hopper, Jennifer Larson. 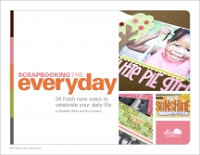 I first met Jennifer through her posting of incredibly inspiring and creative layouts in the Write.Click.Scrapbook. Flickr group. And let me tell you, I was giddy when I learned we would be Ella Friends together. Drop by her blog soon, you will be inspired. If you'd like to begin at the top of the list and make your way through the hop, here are the names of my Ella Publishing Friends with direct links to their blogs! You'll want to be sure to visit the blog of all the Ella Publishing Friends, as we are each giving away a copy of the eBook, "Scrapbooking the Everyday" by Elizabeth Dillow and Tina Cockburn. It's a winner and you'll definitely want to add this one to your collection! Leave a comment here to win this eBook and if you'd like to share, but you don't have to, tell me which everyday moment that's next on your list to scrap. Good Luck...entries close at 8pm on Thursday, March 24th. My boyfriend likes to cook, and I'm going to make him a mini book of all the stuff he's cooked! lol.. I want to do a layout about my eldest DD's blankie - she's had it since she was born and still use (what's left of) it when going to sleep. Ten years later. I am new to your blog. I love the snooks. I ordered two yesterday. I hope I win. 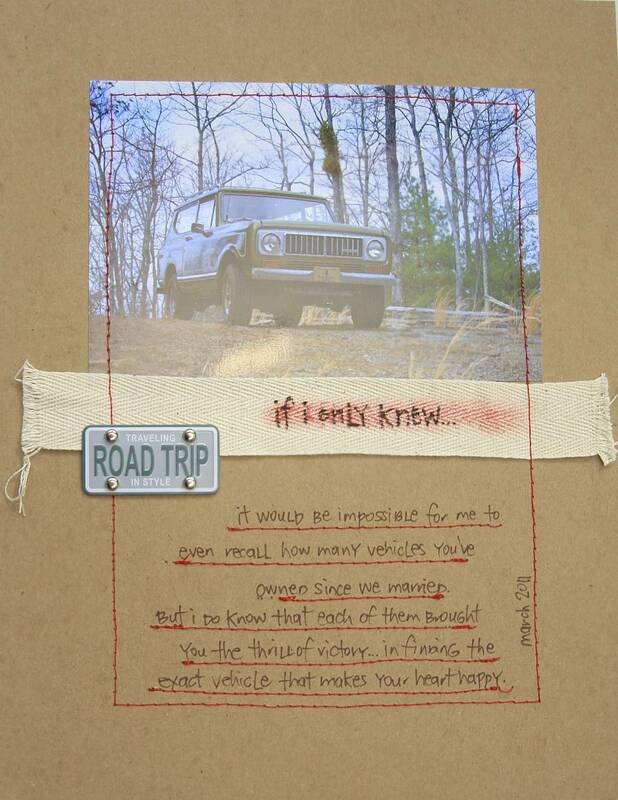 I love your lift...stitching journaling lines is one I haven't seen before and I so love the look!! I want to scrap a layout about all the work my husband does around the yard. Love seeing your inspiration LO and your take. Love the red stitching on yours! I'm not sure which moment. My kids are grown now and I am just in the process of re-thinking my every day type of blessings. There is so much to be thankful for, but I tend to forget that someday I will want to remember the little stuff. Love the moments you captured.I need to do this more! Thanks for the opportunity to win. Love the idea of a WE album. I scrap my kids so much, I forget to scrap my husband & I's relationship. thank you for the reminder. Thank you also for the opportunity to win this ebook! I am super excited to check out this & the other ebooks!! Good luck to all! I'd like to scrapbook the school lunches that I make every day ~ thanks for the chance to win the e-book! Next on my list is photo's of my kids making cookies. Good question. I want to do a typical day, with my typical schedule, and photos throughout the day. Thanks for a chance to win. I am trying to decide about a couple 'all about me' layouts for an upcoming retreat weekend. I think one is going to talk about the things that I do 'when I travel' because I am getting a new job where I'll be traveling a lot more soon and I think some of that is going to shift so it'll be fun to contrast it in a year or 2. Ella has introduced me to some great blogs! Thank you for the opportunity to win this e-book. I'd love to do a funny layout about my husbands current obsession with the moles in our yard! Thanks for the opportunity to win. I need to scrapbook "Love Muggings" between my almost 4-year-old daughter and my 16-month-old son! Their hugs and kisses are definitely almost a wrestle, and we call them love muggings. Thanks for the chance to win the e-book! Love your pages, especially the second one with all the sewing! Hmm, I've been thinking about doing a "day in the life of" page.. so that's next! Oh I so know my next layout is going to be about my son and losing his teeth. He has such a difficult and painful time to lose his teeth and he is almost done, I think one left and he won't lose and more. He can't eat for a day or two before it comes out. I have to capture it. I love the stitching on your journaling box. 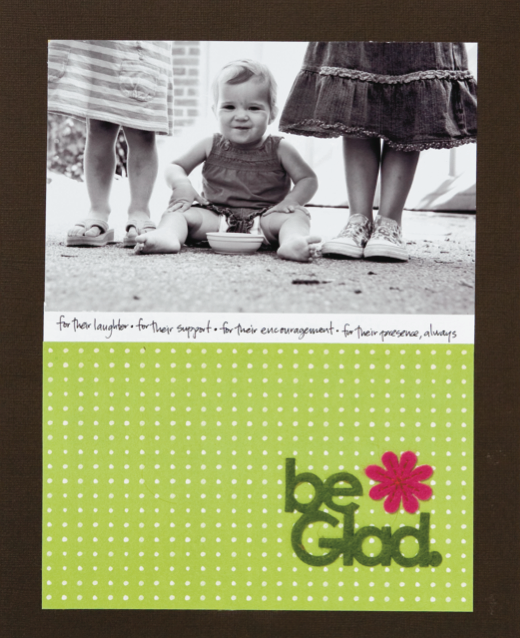 Love the stitching as your border and what you chose as your subject. My next everyday moment is a picture of the chocolate hazelnut ice cream 'pear' that we had for dessert at a Viet Namese restuarant last night. It was beautiful and delicious! And I have so many more moments waiting in my mind that this little ebook would be very helpful. Thanks for sharing! I love your handwriting! I'm planning to make a layout about how much my family and I love playing games. Cribbage is the favorite these days. Thanks for the chance to win, looks like an awesome ebook! Great way to capture such a simple (often overlooked) item in your life. We spend a lot of time each day looking for my grandson's pacifier, his "B". He'll soon outgrow this an I want to be sure to document his love of his "B". Wow Monika! I love the sweet simplicity of your layouts. I LOVE your pages! Thanks for a chance to win! Love the stitching on that layout! This hop has really inspired me to scrap photos of my son coloring and drawing- a new obsession! I am focusing on the kids' school days albums right now as I prepare for a crop this weekend. So the everyday moment that is on my list is school stuff! I need to document times spent with just my husband. I'm planning to document the 8 season TV show my husband and I are working through right now on DVD. That's one of the things we love to do that's so normal and everyday, I might not think to scrap about it! I'm really fond of scrapping the everyday ... I would just love to win this book. The album I'm working on right now is my daughters highschool graduation in 2007. Not an everyday moment but nevertheless a project I have to get done!! Love your layout! I need to scrap the "me help" phase my little guy is going through. Would love to win this - need to scrap food all over my son's face! Love all that stitching on your layout Monica. It's not quite an everyday occurrence, but I do have to scrap my pregnancy journey! Thanks for the chance to win. I'm loving all the peeks into this book - I could definitely use some of the ideas I've seen. I have a photo of my son playing with his Legos that is just waiting to be turned into a page. Thanks for the chance to win! I have pics of my daughter playing at Barnes and noble (our fav store for outing) which are really waiting to be scrapped !! Though a copy of this book would realllyyy help me in my process of scrapping everyday !! Great layouts! Would love a copy of the book. My daughter's love of baby dolls (She's 16 months!) It is the cutest thing and I want to remember it! Thanks for the chance to win.! The next everyday moment I want to scrap is a baking page since I have a huge love for baking and it is the one hobby I've done the longest. The everyday moment I would love to scrap is my college son and I in the morning- chatting with his mom on life in general. I am enjoying it while I still have him living here!